We're Your Taxi... Your Way! Call or App - Any Time! Now you can order a Golden Triangle Taxi any time of the day by either calling us at 519-740-2222 OR by using our free App on your Android or iPhone! With the largest fleet of taxis in the Region of Waterloo, we're ready to provide you with the best in taxi service. When you get into a Golden Triangle Taxi, you can be assured that your driver's a professional who's trained to drive you in a vehicle that regularly meets Regional standards and is properly insured. 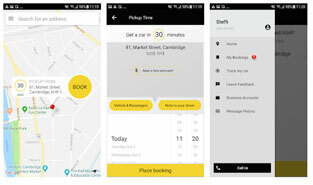 NOW YOU CAN BOOK FROM YOUR SMART PHONE! Learn all about this in the APP tab.